Donald Trump has recognised Jerusalem as Israel's capital, sparking protests worldwide. Palestinians have called for "an intifada." Here are reactions from Palestine, Israel and across the globe. Palestinian President Mahmoud Abbas says the US is "no longer an honest mediator in the peace process" after it recognised Jerusalem as Israel's capital. Preparations to mark Christmas celebrations are under way in the occupied West Bank city Bethlehem while tensions are still simmering in the area after Washington's recent move on Jerusalem. Three Turkish citizens were arrested by Israeli police following evening prayers on Friday at Al Aqsa mosque. There is only one narrative on Israel and Palestine in conservative and liberal mainstream media in the US. The difference lies in the language used, not the ideas expressed. The UN human rights office says an internal Israeli military probe that cleared troops of any wrongdoing in the death of a wheelchair-bound Palestinian protester was "insufficient." 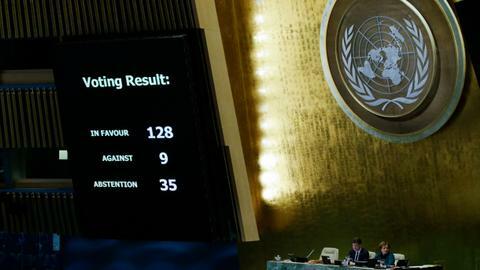 One hundred and twenty-eight countries of 193 UN members supported the General Assembly resolution condemning US President Trump's move on Jerusalem. Only nine countries voted against the Egypt-sponsored resolution. Thirty-five countries abstained. Turkey says UN vote shows "dignity and sovereignty are not for sale"
At an emergency session of UN, 128 countries voted in favour of a resolution declaring the US president Donald Trump's decision on Jerusalem "null and void." 'Day of rage' protests continue as US President Donald Trump's decision to recognise Jerusalem as Israel's capital angers Palestinians and provokes a global reaction. Watch the moment Israeli forces attacked Palestinian protesters in Jerusalem. Clashes between protesters and Israeli troops wounded at least 100 Palestinians after people came out in the West Bank, Gaza Strip and Jerusalem. We reflect on a day of prayers, protests and the plight of the Palestinians. There was no mention of a Palestinian state when Trump said the US was recognising Jerusalem as Israel's capital. So is he backing off of a two state solution, or is there something else going on? Turkey's president Erdogan and his French counterpart will work together to try to persuade the United States to reconsider its decision to recognise Jerusalem as the capital of Israel. The 'day of rage' has begun in Palestine. People around the world are demonstrating in solidarity with Palestinians after President Trump's decision to make Jerusalem Israel's new capital. The strike was carried out on a Hamas post in Nusseirat in the central Gaza Strip amid violence that erupted following US President Donald Trump's controversial recognition of Jerusalem as Israel's capital. Hundreds of Arabs and Greeks protested in downtown Athens. They marched from Parliament to the US Embassy expressing their anger towards Donald Trump's Jerusalem decision. Palestinians have reacted to US President Donald Trump's decision to recognise Jerusalem as the capital of Israel. Thousands of demonstrators across the Muslim world took to the streets in solidarity with the Palestinians, and expressed outrage at US President's recognition of the Jerusalem as Israel's capital. The US found itself without much support at the Security Council where even one of its closest allies, the UK, said Britain disagrees with Trump's move on Jerusalem. Israeli soldiers shot dead a Palestinian man near the Gaza border while dozens of others were wounded on the "Day of Rage." A second person later died of his wounds, a Gaza hospital official said. What does the Jerusalem announcement mean for Turkish-Israeli relations? The leaders of Turkey and Israel exchanged harsh words after Trump's recognition of Jerusalem as the capital of Israel. Although diplomatic ties between the two countries have deteriorated, economic ties will likely be maintained. Israeli army claims the strikes, which struck two locations in Gaza Strip, were carried out in response to rockets which were fired from Gaza. America again defies international consensus and recognises Jerusalem as Israel's capital. US President Donald Trump declared Jerusalem as Israel's capital and some say it could lead to a third Palestinian intifada. So what is an Intifada?